Suge Knight collapsed in court today after the judge presiding over his case ordered bail set at $25 million, Rolling Stone reports. The apparently unconscious music mogul was taken straight to a prison hospital ward. This marks the fourth time that Knight has collapsed in the courtroom and needed to be taken away by ambulance since the beginning of his trial in the murder of Terry Carter. As we reported previously, Knight was arrested for murder due to a hit-and-run incident in Los Angeles in January. According to his defense attorney, Knight’s health-related incidents are the result of his not getting sufficient medical treatment behind bars—he is reportedly dealing with both diabetes and a blood clot. Knight has been kept in solitary confinement, leading to the charge that he hasn’t received the care he needs. During the most recent collapse, Knight apparently slammed his head on a chair. 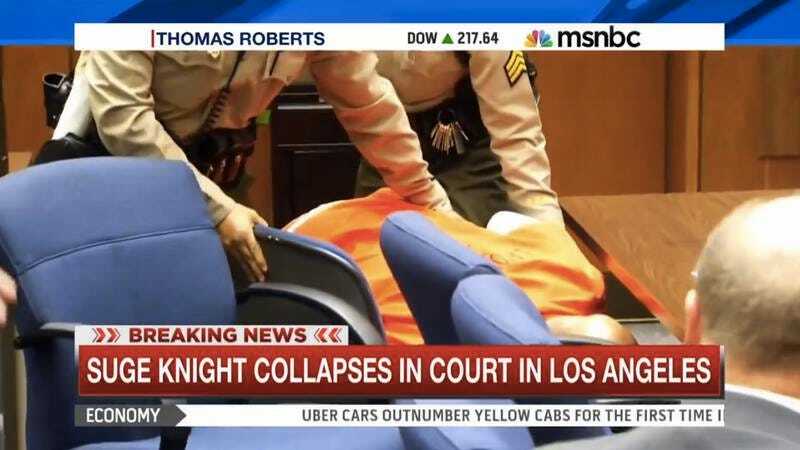 However, Deputy District Attorney Cynthia J. Barnes told media outlets that she believes Knight performed the collapse, saying he “did it in front of the cameras.” In soccer terms, this would make Knight a “flopper.” However, if Mr. Knight is reading this, we would like to say we are staying the hell out of any subjective assumptions about this case, thanks.